It hasn't been a good season for the Bulls with the epidemic of injuries, a coaching change, a major trade, slumps, doubts, questions. Those less kind, and nobody's naming names—for now—suggested they have been dogs. Wednesday in the United Center in a 126-120 overtime victory against the Washington Wizards, the Bulls were proud to be dogs. It enabled them to take a bite out of the Wizards and former teammates Bobby Portis and Jabari Parker. "That's two dogs," Kris Dunn was saying after the game about he and substitute starter Shaquille Harrison, who combined for six steals and helped hold the Wizards without a field goal in the overtime. 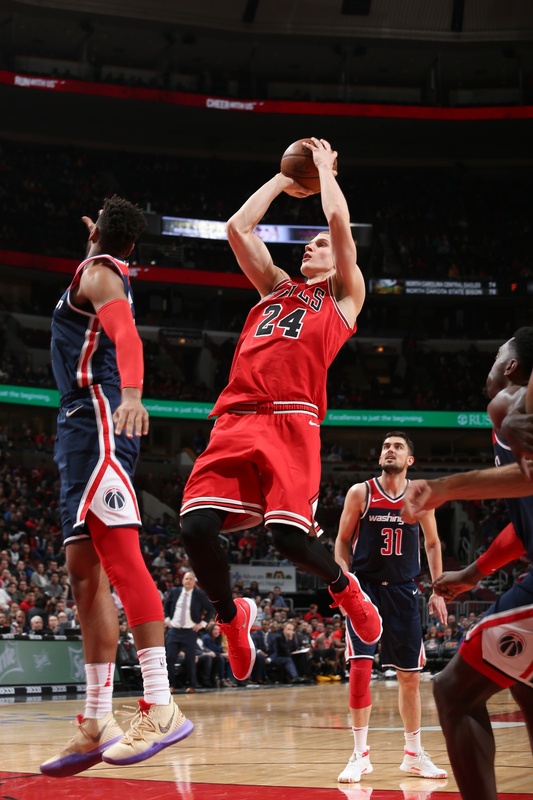 Dunn led the Bulls in overtime with eight points among his season high 26 to go along with 13 assists, making back to back threes in overtime that effectively knocked out the Wizards. Harrison getting his second consecutive start with Otto Porter Jr. out with a shoulder injury and Zach LaVine also sidelined with a thigh problem, added 18 points with a second straight game of four steals. Lauri Markkanen returned to February form with 32 points, 13 rebounds and five of eight threes, though he's still really a puppy. Kris Dunn's a leader. He's a dog. I'm a pitbull and he's a rotweiler. We're defensive guys and we want to get after it. "Two dogs running around," said Dunn about the backcourt pressure with Harrison. "We help each other out. We make it easier for each other and I think we make it easier for the team. He plays hard. He has great feet, great hands, athletic. He's a dog." For his part, Harrison, one of five G-league veterans the Bulls played among nine players available, showed more bite than bark. Especially when teamed with Dunn as they pestered Bradley Beal into seven of 19 shooting and a team worst plus/minus rating. "I love playing with Kris," said Harrison. "He's a leader. He's a dog. I'm a pitbull and he's a rotweiler. We're defensive guys and we want to get after it. We don't want anything easy. You're going to have to go through us to get hard, tough buckets." Talking about making it ruff, ruff for the Wizards. So these Bulls playing G-league veterans for two starters can take a bow for a wow night. I'm not sure how far I can carry this, though with back to back wins even at 21-52, the Bulls are starting to show some teeth and a growl. "One thing we talk about is the next man up," said Bulls coach Jim Boylen. "We also talk about it doesn't matter where you're drafted. It doesn't matter where you're from. It doesn't matter if your family has money or no money or whatever. You step over the line and compete and good things will happen for you. Guys competed. I just love that. Win or lose, I love it when guys do that. That's really cool for me." Though the resurgence of Markkanen and the renewed commitment of Dunn were probably the headlines to the game, it was an impressive ensemble effort from players who have been career strays (OK, that's really it). Shaquille Harrison attempts a layup. Harrison played a career high 39 minutes in starting along with Antonio Blakeney and also had at least two blocks from behind that were clean and obviously so surprised the officials fouls were called. Boylen indicated Porter could miss a few games, though Porter prior to the game told Chicago media he would not miss the rest of the season with nine games remaining. Both Cristiano Felicio with 15 points and Timothy Luwawu-Cabarrot with 13 points had season highs, the beleaguered Felicio with a second straight game scoring in double digits. Ryan Arcidiacono hustled his way to seven points and his allotment of charges taken in what is becoming that time of year, Arch Madness. "When you got Kris and Shaq back there you've got two guys who played football, two guys who are as tough as nails," said Boylen. "Then you throw Archie out there, who is one of the toughest guys I've ever been around. Then you got RoLo (Lopez) who is tough and Lauri who is seven-foot and long and smart. We had our toughest guys out there to finish the game." In this upside down season, the Bulls are putting Lopez back in games for offense. And he came up a fraction late with a drive that could have won the game in regulation. The Wizards had tied the game with 2.4 seconds left in a wild close on a Beal baseline jumper after all sorts of shenanigans and lead changes that included a flagrant foul on Markkanen by Portis. It didn't seem willful, though Bobby was known to swing his arms around. "I don't believe it was intentional," Markkanen agreed, though he did seem to spend the review period searching for his nose. "I don't think he's like that. The thing about Bobby is he just always plays so hard. Some stuff happens. But I don't think that was anything intentional." Markkanen made both frees throws with 50.5 seconds left to give the Bulls a 112-109 lead after their eight-point margin with 3:36 turned into a 109-108 Wizards lead with 1:36 remaining on a Parker full court ramble for a score. Parker clearly likes to make his points to the Bulls, leading Washington with 28 coming off the bench. He had 20 against the Bulls right after the February trade. Markkanen after averaging 26 points in February hadn't scored 20 points since the March 1 four-overtime game. He'd been averaging about 16 points the last 10 games, often hesitant on his shot. But he returned to his quick release, planting himself for catch-and-shoot opportunities. The Wizards finally figured that out, so they crowded him late. Dunn tried to set up the play where he'll make a step toward the lane to draw the defense and pitch back to Markkanen. The Wizards were ready, but Markkanen faked and drove for a score, a move he'd been uncertain with recently. That gave the Bulls a 110-109 lead. Washington committed a turnover and Markkanen rolling in for a layup got mashed in the face by Portis attempting to make the block, though with arms too short to get too close. The officials looked, Markkanen checked for his nose, and got the flagrant foul for two free throws and possession. So a three-point lead with 50.5 seconds to go. "Last year I was kind of able to surprise teams," said Markkanen. "I'm not surprising anybody this year, so I have to figure out how to get around different coverages. I didn't change anything. I just kept working on it every day. There were a couple times where I was fading away and short. So I was trying to stay focused on my follow through and being balanced." The Bulls could have ended it there, but Dunn missed a three (attempting a season high seven). The Wizards then got a driving score with 15.3 seconds left and fouled Arcidiacono, who made one of two for the 113-111 lead with 14.2 seconds left. The Wizards spent about five passes searching out Beal for the tie. So the Bulls had a play left. It was supposed to be for Markkanen, who was inbounding to get the ball back. But the Wizards wrapped him up—perhaps improperly—and Lopez was stuck to drive. He needed about another second. All of us know Kris can score. He can turn it on and be aggressive when he wants to. He's a really good player. He has been doing a good job of finding people. It had been the Bulls game most of the way with a 35-28 first quarter lead with Markkanen scoring 10 points. The Wizards opened the second quarter fast behind Parker's 13 second quarter points, taking a 49-44 lead before the Bulls got some unusual help from Luwawu-Cabarrot for a 60-60 halftime game. The Bulls reclaimed the lead in the third with Markkanen working with Dunn. "It kind of reminded me of last year," said Markkanen. "All of us know Kris can score. He can turn it on and be aggressive when he wants to. He's a really good player. He has been doing a good job of finding people. He's been trying to focus on that. He might not be scoring as much, but he's a really good player. Me and Kris played together a lot last year with Zach being out a long period of time; we built chemistry." Dunn drew the postgame walkoff interview with NBCSports and got a water shower from Blakeney and LaVine about to when Dunn pleaded for mercy and perhaps to avoid electrocution from the microphone. It's been a difficult season for Dunn even after the return from a meniscus sprain. He never seemed able to discern how much to be a facilitator versus a producer, which he talked about at length. "We had to fight through injuries," Dunn said. "It was an all around great game for us, the staff. Getting back to doing what I do, playing with swag. Be aggressive. I said it before, I sacrificed a lot for this team. I don't know if it helped the team or not. But I got to get back to what I do." With just a few games left, it's still a vital time for Dunn given so much community conversation about the point guard position. Is he the one? He was against the Wizards. "If anything, tonight was a confidence booster for him to hang in there," Boylen said. "Stay the course, keep grinding, believe in yourself and it will turn for him." Boylen stuck with his underdog bench the first half of the fourth quarter and they maintained the lead with three Felicio scores. He's still a bit slow to react, but he has been rolling aggressively and finishing effectively the last few games, It was tied at 98 with 5:10 left when Dunn scored on a drive and Harrison chased on a fast break and a three-point play after the Bulls retrieved Washington turnovers. The Bulls would have 66 points in the paint and lead the league in inside scoring for the month, the product of Robin Lopez's drop step moves and the emphasis in interior play with modest three-point shooting. The Wizards came back once again, but they were not about to muzzle these Bulls. Kris Dunn drives the ball. "I wouldn't say more on my shoulders. I would say more on the team's shoulders," said Dunn about the latest absences. "With Zach and Otto being out, Shaq stepped up, Timmy stepped up. RoLo being a vet for the team was unbelievable; Lauri made big time plays. I fed him, too. It was a great all around effort." Best in show, as it were.